Shamayim ‘Shu’ Harris wanted to make a difference in her once-thriving Highland Park, Michigan community. A mother, community activist and former school administrator, “Mama Shu”–as she is affectionately called by friends and family–was inspired to take action after the tragic hit-and-run death of her two-year-old-son, Jakobi RA, in 2007. Rather than fall into despair, Shu chose to heal and honor her son’s memory by transforming blight to beauty with the creation of Avalon Village, an area encompassing one city block in an area just outside Detroit. Shu has assembled a team of engineers, futurists, artists, urban farmers, volunteers and donors from around the world as part of an ongoing effort to build this sustainable eco village on Avalon Street. The project will reinvigorate vacant, blighted lots and structures to into the “Homework House” (an after school learning and activity center for neighborhood children), the “Goddess Marketplace” (an economic development initiative for women entrepreneurs), the “Healing House” (a center for holistic healing), a healthy cafe, activity courts, greenhouses, a micro library and more. 1. What was your inspiration for Avalon Village? I was inspired to make a difference in my city and my community. Highland Park, Michigan was once a beautiful city, known as the “City of Trees.” We were known for our schools, architecture, the birthplace of the automotive assembly line, and the famous factory that made Henry Ford’s first automobile, the Model T. But times changed, industry moved out, and the city became blighted and abandoned. In 2011, our residential streetlights were even removed because times were so tough the city couldn’t afford its electric bill. I started Avalon Village because I believe we deserve a quality living experience and a better environment. What I hope to achieve through this project is to transform blight to beauty and do it in a sustainable way. I want to restore many of the important resources that no longer exist in our community: streetlights, clean, safe places for our children to learn and read and play, housing, job opportunities, and more. We are very proud that our village has the first residential solar streetlight in Highland Park. It shines brightly every night and it’s powered by the sun, there is no electric bill. What I hope to achieve through this project is the transformation of my neighborhood. I am also inspired by the opportunity to demonstrate that you can build with a broken heart. In 2007, my youngest son Jakobi RA was killed by a hit and run driver at the age of 2. Losing him was tragic and devastating and heartbreaking. As a parent, it was my worst nightmare. When I went to sleep that first night, I didn’t know if I would make it because I didn’t have my son. But I woke up the next morning and I was still living. That’s when I knew I was invincible. I made a conscious decision to transform my grief into joy. My work building Avalon Village is very much a healing journey for my family, my community, and me. 2. What is Avalon Village? How did you come up with the design? Avalon Village is a sustainable eco-village being built in Highland Park, MI (a city surrounded by Detroit.) Our village currently encompasses one city block from Woodward Avenue to Second Street. We own 30 parcels of land including six blighted structures (two of which will be torn down in the spring.) We are transforming this block – one of the city’s most blighted, forgotten blocks – into a safe, functional, energy efficient and beautiful space for the entire community. I am not an urban planner or a wealthy developer. I came up with the design by looking at an aerial photo of my neighborhood and placing sticky notes where I felt we should put things that were missing in our city – a clean, safe park for children and families, an after-school Homework House, a healthy café, basketball courts and a playscape, a healing house, a community greenhouse, affordable housing and more. 3. Tell us how you plan to complete the project in stages? Construction is in the final phase right now for the Homework House (a formerly condemned brick house) that we are bringing back to life. The Homework House will provide a clean, safe place to learn and play. It will house an after-school program, music/recording studio, a computer lab, learning kitchen, study space, laundry and shower facilities and more. Outside, five lots have been cleared and graded for basketball courts and a playscape. Completing the Homework House is our number one priority and we anticipate it will happen this year. The house already has a geothermal heating and cooling system and a solar roof, two major energy saving components that will help us save costs going forward. Two shipping containers have been transformed into the Goddess Marketplace, an economic development initiative for women entrepreneurs. Essentially, it’s a neighborhood store where women can sell their products and crafts without having to pay high rents for a storefront. A prefabricated house donated by the Ellen DeGeneres show is in place and final connections are being made with the HVAC system to transform the space into our village Headquarters and Welcome Center. This year, two blighted, vacant houses will be torn down to make way for future development. Underground tanks from what used to be a gas station will be removed by the state so we can develop that land as part of our Blue Moon Café, a healthy café and greenhouse that will also provide jobs and serve as a community gathering place. 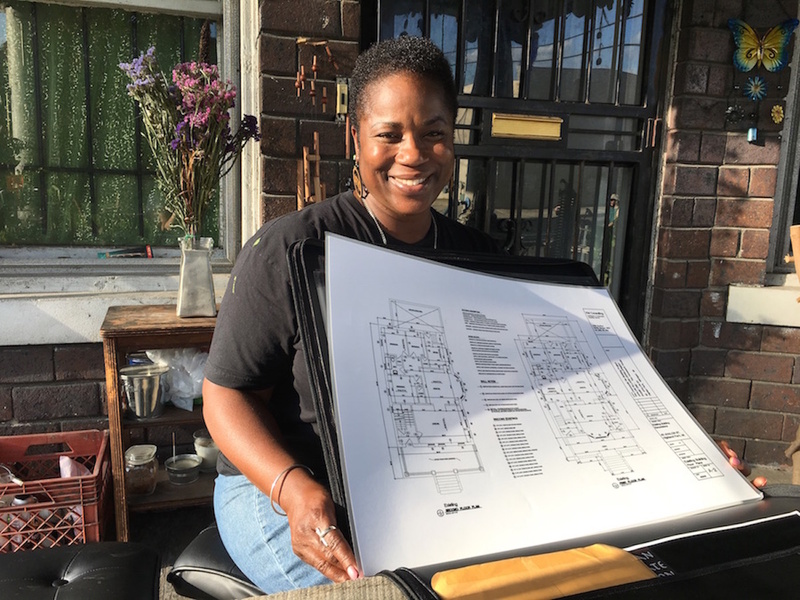 Future plans also call for a STEM Lab, a micro-library, affordable housing, a Healing House for massage, tai chi and other healing arts, and more. Our village continues to evolve and plans are still in the works. We are actively developing strategic partnerships and raising funds to complete each phase of construction. 4. What has been the community response to the project so far? The community response to the project has been amazing and we are truly grateful for the love and support. Our community events are well attended and packed with residents. Our programs for children, like our summer Hood Camp (an overnight camping experience) and Music Camp are sold out, we have received numerous awards from the City of Highland Park, Wayne County, major corporations like General Motors and Ford Motor Company, and many more. Most of all, we are incredible grateful for the financial support from our many donors locally, nationally and across the world–from those who donate $5 or $10 online because they believe in our mission to people who purchase big ticket items (like a snow blower) from our wish list, to those who offer to volunteer, to major donors who provide significant financial support. 5. Do you plan to expand the concept to other cities? What are your future plans? We would love to see the Avalon Village concept expand to other cities–many cities and residents have reached out from places near and far to learn more about our efforts. Our future plans include completing our village one phase at a time, introducing more programming, and continuing to expand to the second block of Avalon Street. For more information about Avalon Village, go to theavalonvillage.org.